This post was published in December 2015. Click here for the most current information about CareMaps. A care map is a helpful way to visually represent all the people and services involved in a family caregiving situation. Drawing your own will show you and others at a glance who cares for whom, how frequently they provide their care, and roughly how far away they live. We make good use of care maps ourselves in the Atlas of Caregiving project. They help us understand how caregiving works in the families we study. Once you’ve drawn your care map you’ll almost certainly find it helps everyone – family members, friends, and health professionals – better appreciate who’s involved and what they’re doing. Care maps don’t just help you see who’s involved, they can also show who or what might be missing. Perhaps there are people who could be helping, but currently aren’t. Maybe there are services that could be supporting you, but you’re not making use of them right now. Drawing your own care map is easy. Making use of it is straightforward too. So we’ll show you how to do it, how to learn from it, and (all-important) how to act on what you learn. For a quick overview just read The Basics. If you’d like to understand the techniques even better, also read More Details. We’d love to hear about your own care map drawing experiences and what you learned from them, so please share your reflections with us and our community in the comments section below. But don’t just tell us, show us. If you’re happy to do so, why not share your care map on Instagram, using the hashtag #caremap so others can see it? How do you draw a care map? Start by watching this short video. 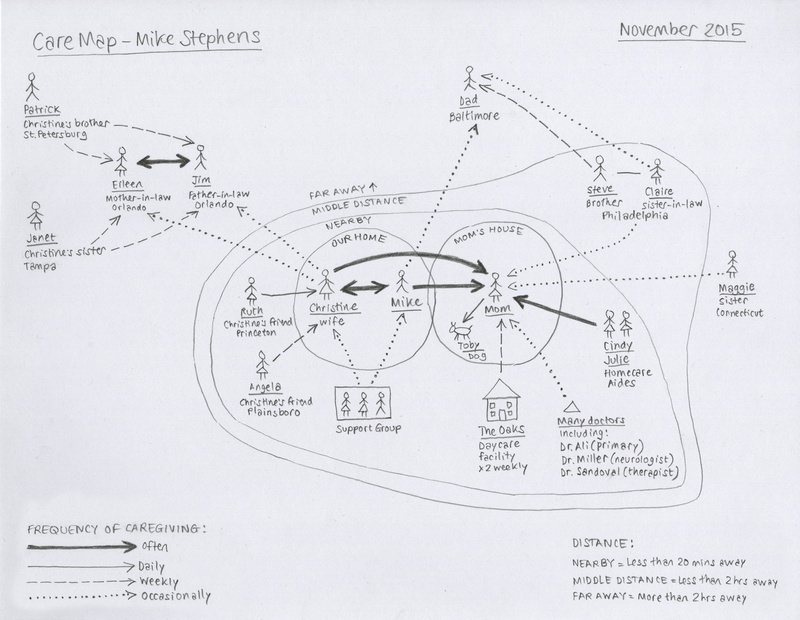 It gives a quick overview of the main techniques involved in care mapping, and shows a care map being drawn for a fictional caregiver called Mike Stephens. After you’ve viewed the video, read the instructions below. You’ll need a pencil, an eraser, and a few sheets of blank paper, preferably plain without lines or grids. The eraser and extra paper will be handy as you’re bound to make mistakes – everyone does – and being able to erase errors or restart on a fresh page will free you from feeling that you must get everything perfect from the start. Stick men and stick women — for male and female family and friends. Triangles — for professional caregivers. Who else cares for them? It’s helpful to write names under the symbols for the people, places and services on your map. As you add information, don’t worry about trying to make it perfect or complete. There’ll be plenty of time to add missing people and make other corrections once you’ve established the overall structure, and don’t forget that you have an eraser. OK, let’s get started. Begin by drawing yourself right in the middle of the paper, then steadily add other people. As you do this, try to use distance on the paper to represent geographical distance. So if someone’s nearby, draw them close to you on your map. If they’re far away, draw them near the edge of the paper. Far Away (more than two hours away). Finally add your name and the date. Caregiving situations often change over time, so you may decide to redraw your map once in a while. And that’s it, you’ve drawn your first care map. For a more in-depth look at care mapping, along with further tips and advice, see the More Details section below. You’ve drawn your care map — now what? After you’ve drawn your first care map it’s time to reflect on what it shows you, and maybe to notice anything which may be obviously missing. Sit down comfortably, perhaps with a cup of tea or coffee, and look carefully at what you’ve drawn. You almost certainly carried all this information in your head, but it could be the first time you’ve seen your caregiving situation laid out as a diagram. Your care map could therefore help you get a clearer understanding of your own situation. Who are the people on the map who are indispensable (perhaps including you)? What would happen if they/you were temporarily unavailable? Who could step in? Are they prepared to do so? Are there key people missing from your map altogether? Perhaps there’s someone you take so much for granted (for example, a spouse, child or best friend) that you’ve simply forgotten to put them on the map? Are there key family members who really should be involved, but aren’t? Are there key professionals missing? Is everyone on your map aware of who else is involved? Does everyone know how their actions impact on other people? If you’ve found these questions thought-provoking you’ll find others below in the More Details section. You’ve learned from your care map. How can you take action? Reflecting on your care map could help you become more aware of your own workload and responsibilities, and how you feel about this. Being conscious of it is an important first step in getting help, and if you use your care map to talk to others, it increases the possibility that you’ll find people to lend a hand. So by all means share your care map with others to spark conversations about the overall situation, your needs, and their involvement. A good place to start is with the friends and family members who are also on the map. Perhaps even give people their own copy. You might be surprised to learn how unaware they are of the wider caregiving structure, so talk it all through with them so they get a better appreciation of who else is involved and what everyone does. Talk together about what’s easy, what’s hard, and what might make things better. Be sure to share your care map with all the key care professionals. It will help them form a picture of all the people involved, who needs to be a part of decision-making, who needs to be consulted and informed, and who might benefit from training or education. Also use your care map to help these professionals appreciate the fullness of your situation – all the people you care for, as well as your non-caregiving responsibilities. Having a deeper understanding of your life could help ensure they don’t overburden you. See the More Details section below for other ways that a care map can help you take action. Our care mapping technique is new, and as you draw your own care map you may have suggestions that could make producing them better or easier. If that’s the case we’d love to hear from you in the comments section below. As caregivers ourselves, we’re convinced that everyone involved in providing care can benefit greatly by learning from other people’s experiences. So please tell us what you discovered when you drew, reflected upon, and shared your own care map. Finally we invite you to share the care map itself. Take a photo with your phone and upload it to Instagram using the hashtag #caremap. Although the broad concept of care mapping isn’t completely new, our particular way of drawing them is. We start by focusing on you as a family caregiver, then expand this to include all those you care for, as well as everyone else involved in caring for them. Finally, very importantly, we ask who cares for you. This interconnectedness, though sometimes messy, is what our lives and families are really like. Previous care mapping techniques have tended to take a “medical” perspective, placing a “patient” at the center, then putting the emphasis on the professionals involved, with only a little notice paid to family caregivers. Care maps made with such a methodology usually do a poor job of reflecting the lived reality of most family caregivers. The Atlas of Caregiving approach to care maps is different. It’s designed to focus on families, helping you and others better understand your actual care situation. In general it’s best to work with your paper in landscape format — that’s with the longest side horizontal. Ordinary letter-sized paper (A4 if you’re outside the USA) is good. Our example was drawn on this size of paper. But if you’ve got something larger, say legal size or even 11×17 (A3), it can make things easier. In answering the questions “Who do you care for?” and “Who else cares for them?” think of all those you help due to their illness, disability or aging. Be sure to include pets, those in your home, and especially those you care for. Recognize that such support can take all forms, from helping with medical activities and healthcare management, to lending a hand with personal activities and housework, and even just keeping people company, or perhaps keeping alert in case they’re needed. When it comes to “Who cares for you?” you may want to think more broadly, including anyone whose support allows you to care for others. Perhaps a friend makes meals for you, knowing you’re too busy caring for your mother to take proper care of yourself. Maybe there’s somebody you meet up with now and then who gives you emotional support and lets you safely vent about your frustrations. Note that sometimes both ends of a connecting line need an arrowhead, when two people care for each other. Feel free to use colors. You could choose different ones for family, friends, and professionals. Or use bolder colors for those heavily involved, and paler shades for those lightly involved. To make the care map useful in an emergency why not include phone numbers under people’s names? If you use a large piece of paper and have more room, you could add a few words about how each person helps. For example: “keeps company”, “helps with health decision-making”, “financial assistance”, “provides respite when needed”, or “does everything!”. Redraw your care map from time to time as things change. You might learn something by thinking about those changes. Has a new person’s involvement made things easier? Has the absence of someone changed what those remaining are doing? After you’ve drawn your care map, capturing your thoughts on paper, one useful tip is to start by taking a “helicopter view” of your creation. Literally step back from it so you’re not distracted by its detail, and examine its overall shape. Does it seem complex to you? Or is it surprisingly simple? Are some parts of it “busier” than others? Have you drawn something that feels as though it has caregiving connections all around the center, or is it somewhat one-sided? If it’s the latter, what might that suggest? Having taken a helicopter view, it’s time to get back down to ground-level again, and look at your care map in detail. Are there people on the map who are indispensable (perhaps including you)? Perhaps someone could stand in for them a while, if that’s possible. But how would they know what to do? Maybe it would be sensible to think about some kind of informal “training” or briefing? Who makes the major decisions about this caregiving situation? Does that seem right, or fair? Does anyone else need to be involved? How aware are those you’ve placed on the care map of the others who are also on it? Does everyone know who does what? Are people aware of all the time, physical, emotional, and financial costs? Next, a good overall question to ask yourself is whether anyone is missing from the care map altogether? Perhaps there are people you take so much for granted (for example, a spouse, child, or sibling) that you’ve simply forgotten to put them on the map? If so add them now. Then again, perhaps there are key family members who should really be involved, but aren’t? Could there be a way, if you so choose, to get them more involved? Another possibility with missing people is that you might identify areas in which you could get professional support but currently don’t. For instance one of our team members realized when he drew his own care map that although he once had weekly sessions with a psychotherapist, they’d stopped when he moved from one part of the world to another. He hadn’t found a replacement. Are there professionals missing from your own care map? How do you approach communication and coordination with, and between, everyone on your care map? In many family caregiving situations it’s common for one person to act as a kind of communications hub. This person talks to everyone on the map, passing on information as needed. But although this can be effective, it places the person at the center under a great deal of pressure. Maybe, though, you’ve found some great management methods or tools which work well for you. If so, please consider sharing them with us. How do you feel about your own workload and responsibilities as one of the (perhaps the only) main caregiver(s)? Perhaps there are activities and tasks you’d prefer not to have to tackle? Becoming aware of them is an excellent first step in getting assistance. Of course maybe it really isn’t possible to find help, but at least think about the possibility of someone lending a hand. Talk things through with friends and family, and maybe seek advice from appropriate professionals too. Why not begin by showing your care map to others? It makes particular sense to share it with some of the people on the map itself. You could be surprised to find out how little they’re actually aware of the wider caregiving structure. Talk it all through with them so they get a better appreciation of who else is involved, and what they all do. It might be helpful to give people photocopies of the map, especially if it’s possible they might need to help in an emergency. You may decide to add one or two phone numbers to your map, for this reason. As an alternative to photocopying, you could take a photograph of the map with your phone, and email it. Talking about your care map is a great way to discuss the involvement of someone else who’s also on the map. Do they have access to everything they need? Are there ways in which their support and assistance could be better managed? If there are difficult aspects for either of you, this may be a good opportunity to air them. Of course, while you may have added everyone involved in your caregiving situation to your map, it’s quite possible you won’t know about other responsibilities they have. Perhaps they face other challenges of which you’re unaware? Talking about your own map gives you both the chance to discuss things. It might even help the other person to compile a care map of their own, so why not suggest this and help them draw it?